(Newser) – "Our message is: Absolutely never do that." That's what Canada's Jasper National Park is trying to communicate loud and clear. 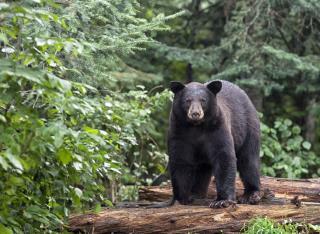 The "that" it's referring to is a May 16 incident in which a man jumped onto a black bear in an attempt to rescue his dog, which had spontaneously jumped from an open car window and barked at the bear, which then attacked it. The dog didn't make it. The man managed to emerge unscathed, with the park's human-wildlife conflict specialist Steve Malcolm suggesting to the CBC that "prey-fixation" was his saving grace. This story was run by Newer a few days ago. What the heck? Its from 6/19. Someone made a mistake or they ran out of news. I'd almost anything to save my dog. Sorry "Petey", if you go after a bear. Yer on your own.